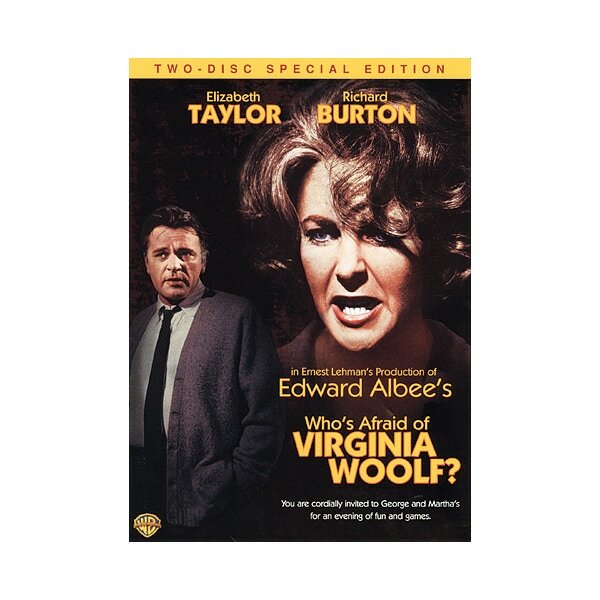 (Academy Award Winner for Best Actress/Elizabeth Taylor & Best Supporting Actress/Sandy Dennis; also nominated for Best Picture, Best Actor/Richard Burton, Supporting Actor/George Segal) Elizabeth Taylor and Richard Burton are in their element as an extremely dysfunctional married couple in first-time film director Mike Nichols's searing 1966 adaptation of Edward Albee's Tony Awardwinning play Who's Afraid of Virginia Woolf? Portraying the abusive Martha, Taylor is ideally paired with Burton, who plays George, her emotionally spent spouse. George Segal and Sandy Dennis costar as a younger couple that strays into George and Martha's destructive path. DVD extras include two featurettes on the film and one on Taylor, plus a 1966 interview with Nichols and his audio commentary on the film.